I have been trying to eat only locally grown sustainable foods since last Autumn. I am not quite ready to go on the 100 Mile Diet yet because I am still using a few things that aren’t local, like canned tomato products. Once tomato season starts, I’ll put some up and there will be no looking back. One of the things that goes along with being a locavore is the seasonality of the fruits and vegetable in one’s diet. We roll into Spring after a winter filled with greens and root vegetables. 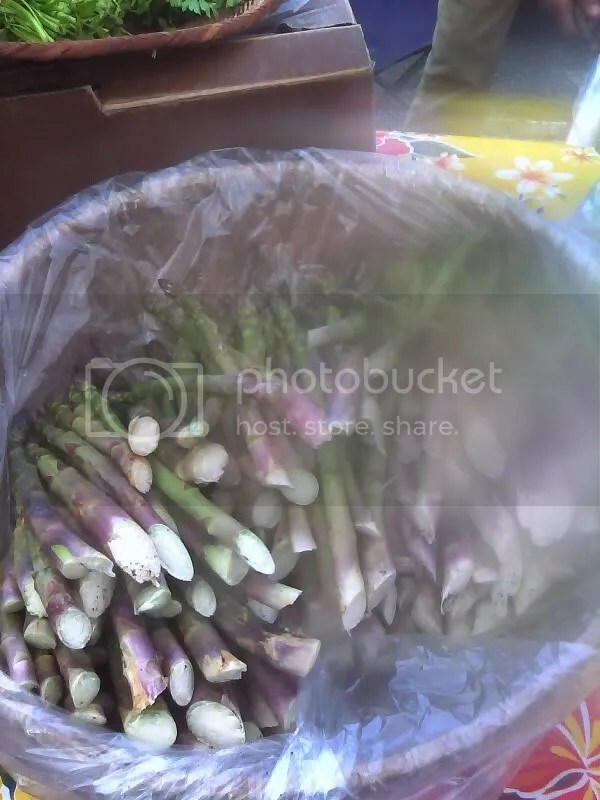 Two weeks ago at the Farmer’s Market Bernier Farms had some offering that heralded the arrival of Spring, particularly the asparagus. Oh how I have missed asparagus! Before committing to eating local, sustainably grown foods, asparagus was on my table once or twice a week. I have almost heeded the siren call of the Mexican asparagus at Trader Joe’s more than once. The asparagus from Bernier Farms was fresh, tender and delicious. We have had some for the past two weeks. I am eagerly anticipating getting some tomorrow at the Farmer’s market. We’ll be eating asparagus at least once a week until the season ends. This entry was posted in Locavore and tagged Bernier Farms, Farmer's Market, Food cravings, Locavore, sustainable food. Bookmark the permalink.